New concept in tank valve systems. 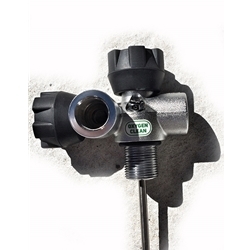 Each 300 bar valve has two independently controlled DIN outlets. It can be used with two 1st stage regulators as an H-valve. Left and Right model can be connected by special flexible crossbar for double tank manifolded configuration. The advantage of this system is that the double tanks can be disassembled without being emptied. The LOLA manifolds do not have single point of failure found in other manifolds with isolator, since each side can be independently isolated. Each valve has 3/4 NPS thread. The valves can also be used on a Flex, Hammerhead, KISS or COPIS CCRs with balanced and unbalanced regulators for larger depth range. Select correct left or right valve for your application. Left or right is determined with your face away from the valve opening (i.e., the tank is on your back). Typical CCR oxygen tank on the right side of the unit uses LEFT valve. All valve handles are black. 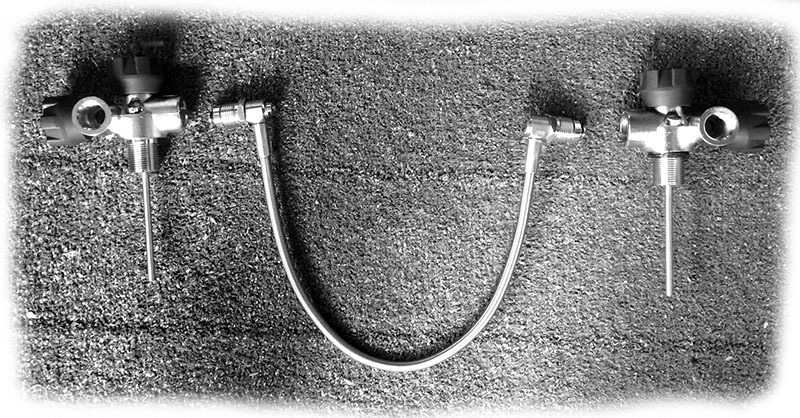 Flexible DIN Connector (available separately) is 20 in /51cm long. Very smooth, more than met my expections. I have 4 tankes with these valves and they are the best. I want more of them.